Following the amassing of thousands of dead bunker fish on the shores of the Shinnecock Canal and surrounding area on November 13, 2016, health officials issue advisory. Health officials are warning residents and visitors who work or recreate near these waters to follow some common-sense recommendations. Photo by: Ana Perugini, licensed under CC-BY A 2.0 Generic. 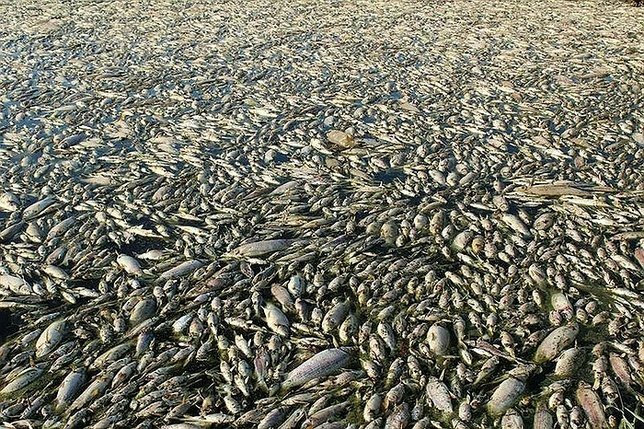 Hampton Bays, NY - December 2, 2016 - Following the amassing of thousands of dead bunker fish on the shores of the Shinnecock Canal and surrounding area on November 13, 2016, health officials are warning residents and visitors who work or recreate near these waters to follow some common-sense recommendations. Avoid water with accumulations of dead fish. Avoid recreating in cloudy or discolored water, as it may contain more microorganisms that might make people sick and affect a person's ability to see underwater hazards. Don't swallow water and keep your face and head out of the water. This reduces exposure to bacteria, parasites, and other microorganisms that might make people sick by entering the body by swallowing, and through eyes, ears and nose. Wash your hands when you leave the water and before eating. Do not touch your eyes, nose or mouth before washing your hands. Shower as soon as you are finished with your activities for the day. Do not handle or eat fish that are found dead, dying, acting abnormal or seem sick. If you must handle dead or decaying matter, make sure your hands are covered with disposable nitrile, rubber or plastic protective gloves or a plastic bag before touching the fish. If your skin is exposed to the dead fish, wash your hands thoroughly with soap and water. If you accidentally ingest any decaying matter, seek medical attention immediately. Fish can be contaminated with bacteria, viruses or parasites that can cause illness. It is difficult to determine the risks from eating live fish caught from areas where there are large masses of dead fish. If you have caught a live fish and choose to eat it, be sure to cook the fish thoroughly to kill bacteria, parasites and other microorganisms, as is always good practice. Subject: LongIsland.com - Your Name sent you Article details of "Health Officials Issue Advisory for Shinnecock Canal and Surrounding Area"